Re: Ice Fishing Lead Mold. Com on doit.......get with the ice game. Honestly I think most guys just use tungsten jigs these days for ice fishing. I think you're right MikeJ. They use tungsten jigs in this area. I’ve stayed off of this thread because I’m simply not as serious about ice fishing as I am open water fishing. Even though I only sit on a bucket jigging for pannies around a dozen times (average) per season, I have three molds that I use strictly for ice jigs, including one modified via dremel and JB putty to get exactly what I wanted… which is what I would recommend to you. When looking at the current Do-it line up, as Walleye Wacker mentioned, I think the shad dart jig (https://store.do-itmolds.com/Shad-Dart-JigbrSz-164-132brHk-570-or-575brCollar-None_p_710.html) would be easiest for you to personally modify into a marmooska style jig like you’ve been hoping for simply by making provision for the hook to lay the other way in the mold. Another option could be to carve out the collar on the 1/80 or 1/64 oz semi-custom jig mold (https://store.do-itmolds.com/Round-Head-JigbrSemi-CustombrSz-180brHk-570-or-575brCollar-Plain_p_1079.html) to make your marmooska style jig; supposing this mold price might be too high to tinker with, then I think the roundhead reverse barb jig (https://store.do-itmolds.com/Round-Head-JigbrSz-180-164-132-116-18-14brHk-570-or-575brCollar-Reverse-Barb_p_528.html) could also be an option for a similar modification. If you are unwilling to modify a mold currently available, going straight to CNC (as others have suggested) might be your only other option to attain the exact mold you are looking for. I have taken a couple tours of their facility and I'm sure Do-it would not be able to mass produce this mold through sand-casting as they do with virtually all of their other lead molds (because of the precise design and hook style you are looking for). Even if they could sand cast this, going from conception to design to production costs the company thousands, before they even sell one. Then they would have to sell hundreds in order to recoup their investments since they sell the vast majority of their molds at wholesale (to retailers where most people buy them). I’m sure the company has analyzed their potential investments against the potential sales and given the age of this thread without response from headquarters, I think you might be beating a dead horse... which takes me back to my initial thoughts that a dremel and JB putty (or CNC) could have you in production much sooner than the time this thread has been around. Not to mention the need for a special hook to work in this application....costs for such? Another strike against. The biggest hit is that this head design is all over the internet as un-finished heads for near dirt cheap. I don't get it....why this has gone on and on when as you say its a dead horse EF. The biggest hit is that this head design is all over the internet as un-finished heads for near dirt cheap. Right, they certainly can be purchased cheap enough for individual use (or for resale); however, I also understand (all too well) the desire to make our own gear... this is where I tend to want my things to be unique to me, which is where I really get into the modifications. I've used about every style of ice jig out there (including the requested marmooska) and I keep coming back to the 1/64 collarless roundhead jig because when pannies are just puffing the bait (biting light), it spins easiest into the mouth... sometimes just simple physics makes all the difference. I can see where this would work... I did a similar mod using a #12 hook on the 1/48oz minnow head jig (https://store.do-itmolds.com/Minnow-Head-Jig-weyesbrSz-148-132-116-18-316-14-38brHk-570-or-575brCollar-Barb_p_555.html). x2 - I'm also a fan, and you could add that it hangs, for the most part, horizontally especially with a knot positioned at the back of the eye, which can be hard to accomplish with some ice jigs on the market. Good point Kyle. Horizontal bait presentation is in my opinion the most important peice of the puzzle when it comes to bluegills. If that jig is hanging at an angle it turns fish off in a big way. 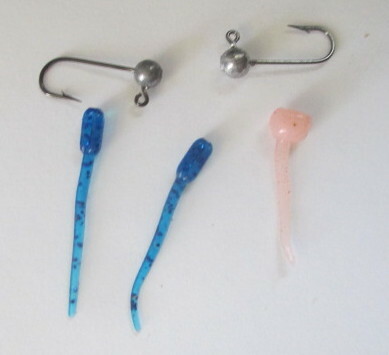 To help with size perspective, here a picture of a 1/80 head on the left and a 1/64 on the right, both cast on #10 570BP Eagle Claw hooks and shown with the 1" Ice Tickler and one body segment and tail from the 1.3" Wax Wiggler. Rigged in any combination of weight or plastic shown, a very compact, active presentation can be made. The tie to the eyes of these hooks can be adjusted to achieve any degree of bait angle desired including absolute horizontal which can be imperative on some panfish bite. The eyes, aligned to the length of the hook will also minimize bait spinning as opposed to the flat eyes found on so many of the "diamond jig" style of baits today. I can't see the featured jig in the opening post and can't say if its a flat eye or not, but the diamond style of jigs are notorious for spinning regardless of eye disposition. Anyway, with the heads and baits shown, this would be finessing at its finest. And available without fussing. Here are a few that were featured in a past Midwest Outdoors article done by our forum's own Marc Wisniewski aka Partycrasher. Link for the article, please. I was unable to find the article online. It was an article in the 2017 December Midwest Outdoor Magazine.